Chicago is hot right now. The Cubs finally won a world series, Bon Appetit named it best restaurant city of the year, and along with dazzling architecture and world-class museums, there’s the friendly Midwestern attitude. Chicago is a city of neighborhoods and we were determined to navigate our way around before our trip was over. We crisscrossed our way around the city, walking the 606, eating in Logan Square, taking photos in Millennium Park, even visiting U Chicago, our first time in Hyde Park. We played tourist, and though it wasn’t our first time, it was the first time in a long time. In the end, we had a lot of fun, and yes, got more of a sense of the city. Now, we’ve got you covered with all the best things to do on your next visit to the Windy City. On the Water: If this is your first visit, or if you’ve never been (shame on you) heading out on the architectural boat tour is the best way to see the city’s famous skyline all while learning historical facts about Chicago. Over the years we’ve dragged our reluctant husbands and kids who loved it, apologizing afterward for their hesitation. Chicago destroyed after the great fire in 1871, was a blank canvas and rare opportunity for the prominent architects of the day. This is a fascinating tour, and a lovely way to spend an hour and a half on the Chicago River. Different operators offer boat trips; we highly recommend you choose the one here by the Chicago Architecture Foundation with the most informed and well-versed docents. Riverside: Take a walk along the Riverwalk; with the city as a backdrop it’s hard to get more scenic. Throughout the season there are live music events, public art exhibitions, and special events. Want to be more active, rent a kayak at Urban Kayaks and get paddling. You can grab a bite or drink at one of the cafes along the water such as O’Brien’s Riverwalk Café, Tiny Tapp and Café or City Winery. Get Loopy: The Loop is Chicago’s most well-known neighborhood, the historic district south of the river and home to Millennium Park, one of our favorite city parks anywhere--a mix of art, architecture and lovely gardens. Start with a mandatory stop at Anish Kapoor’s Cloud Gate, also known as The Bean, providing wonderful photo ops as you walk around and under the elliptical reflective sculpture. Try and go early before the crowds descend. After, be sure to walk on the BP pedestrian bridge passing by the Jay Pritzker Pavilion both designed by Frank Gehry, a master of striking architecture. The 925-foot-long bridge is a stainless steel shimmering wonder, resembling a giant snake with killer views of the city skyline. The Crown Fountain is our favorite landmark in the park, designed by Spanish artist Jaume Plensa, it consists of two 50-foot glass towers with LED screens at each end of a shallow reflecting pool. Kids run back and forth as video images of actual Chicago citizens, spouting water from their open mouths serve as real life gargoyles. The collection of faces serves as a tribute to Chicagoans, taken from a cross-section of 1,000 residents. Note: The fountain’s water features operate during the year between mid-spring and mid-fall, while the images remain on view year-round. Breakfast with Obama: Ok, well a life size photo of him anyway at Valois, known as one of the 44th President’s favorite haunts. This old school greasy spoon neighborhood landmark serves breakfast all day—eat at Obama’s favorite table complete with his portrait under the glass tabletop (a little hokey but fun.) Hyde Park is home to U Chicago, a stunning ivy draped campus that’s worth a wander before heading to Frank Lloyd Wright’s Robie House, considered one of the most important buildings in the history of American architecture. After, head to the impressive Museum of Science and Industry, the largest Science Museum in the Western Hemisphere. Be Hip: Head to Wicker Park and neighboring Bean Town for shopping in smaller indie and eclectic boutiques. Have lunch at Big Star, Doves Luncheonette or the new Publican Anker. Go for a walk on the 606, Chicago’s elevated rail line, converted into a walking promenade. Don’t expect the drama or the varied design of New York’s Highline; the 606 is not in the same league, rather used by locals for a bike ride or jog. Still, it’s nice for an afternoon stroll. Looking for a unique experience, check into The Chicago Athletic Association with a fantastic location across from Millennium Park. The 1890’s club has been reborn as a hotel with a rooftop restaurant and bar and a 15,000 square-foot game room with built-in bocce, shuffleboard and billiard tables—fun and funky, kids will love it! The lobby, like the rest of the hotel, is brimming with historical architectural details, original working fireplaces, stained glass and ornate millwork. It’s a comfy place to read the paper over a morning coffee. Rooms can be small and dark, request one on a higher floor for more light. Looking for something more traditional check into the business orientated Langham, luxurious Peninsula, boutique Thompson or the stylish Soho House. Chicago’s is often referred to as the“Windy City, ” thanks to the vigorous gusts coming off Lake Michigan. The winter months can be extremely frigid, especially with the wind chill off the lake. We suggest you visit in late spring, summer or early fall when it is warm enough to enjoy the lake and other outdoor activities. 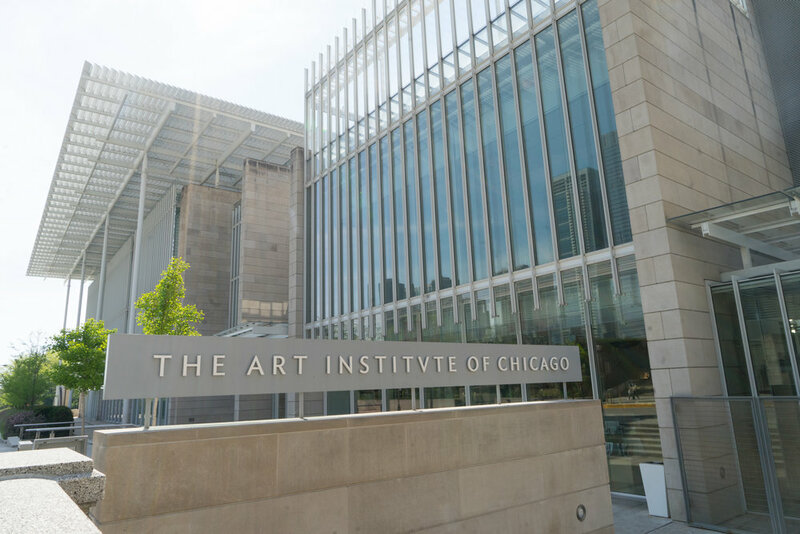 Two Art Gems: The Art Institute is a Chicago treasure with a new wing designed by world-renowned architect Renzo Piano. The permanent collection boasts over 300,000 works so allow at least an hour or two to explore. The Museum of Contemporary Art, housed in a Josef Paul Kleihues-designed building offers is recognized as one of the best in the country offering compelling exhibits and original programming. Save time for a wander in the MCA store, rated one of the best museum gift stores in the country by the WSJ. Window Shop: Chicago has two great women’s boutiques, both outrageously expensive, to rival anything in Paris or NYC-- Blake and Ikram. Ikram, named after owner Ikram Goldman, showcases the best of women’s fashion, featuring American, European and Japanese designers in a dazzling space. Ikram herself got a lot of attention for dressing Michelle Obama. There is a café on the second floor, nice for lunch or an afternoon coffee. The large, open gallery like space, at Blake in River North, formerly an old post office, is where chic Chicagoans shop for European fashions. Both stores are drool worthy inspiration stops, even if you’re only browsing and not buying. Lakeside: If you get lucky with the weather, allow time for a stroll, along Lake Michigan –its easy to forget it’s a lake and not an ocean—on a beautiful day everyone’s out—sunbathing, biking, jogging and even swimming. Family Sights: You’ll have fun too as you explore the Field Museum, Adler Planetarium, The Shedd Aquarium and the Lincoln Park Zoo with your kids. Drinks at Dusk: Head to Cindy’s on the roof of the Chicago Athletic Association Hotel with expansive views over Millennium Park. Alternatively, if you’re having dinner over in the West Loop, enjoy great design and delicious cocktails at uber chic Soho House. Dinner: See our hot list of Chicago’s Best Bites including one of our favorite restaurants of the year, Giant, here. LOL: The Second City is the legendary improv comedy club that has been a training ground for some of the best comedians of our generation including John Belushi, Bill Murray, Tina Fey and Stephen Colbert just to name a few. Book tickets well in advance so as not to be disappointed—shows often sell out!